The International Journal of Music in Early Childhood, formerly published as Perspectives: Journal of the Early Childhood Music & Movement Association, is an interdisciplinary forum directed at the empirical study of music in early childhood, or pre-birth to age 8. The journal is published in association with the Early Childhood Music & Movement Association, and provides a source of professional development to those committed to improving the lives of young children through music. 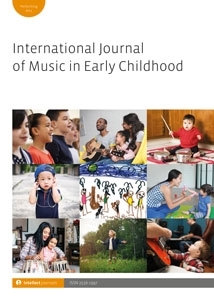 The journal includes research-based contributions from fields such as music education, music therapy, community music, psychology, ethnomusicology, anthropology, sociology, history, philosophy, childhood studies and social work, that are concerned with diverse aspects relating to music in the lives of young children. Areas covered will include young children’s development in and through music, pedagogical theories and tools for practitioners and researchers, early childhood music education policy, and music therapy for infants and young children. The journal will explore music in settings such as daycares, preschools and other educational spaces, as well as within families, peer groups and the community, and will reflect on views and practices in early childhood music from different regions and cultures.